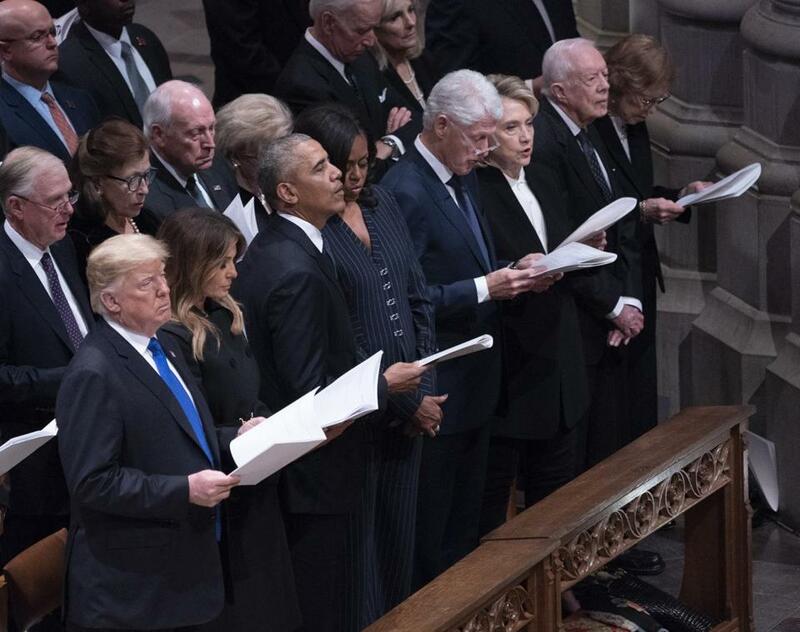 Attending former President George H. W. Bush’s funeral at the National Cathedral Wednesday were (from left) President Trump, First Lady Melania Trump, Barack Obama, Michelle Obama, Bill Clinton, Hillary Clinton, Jimmy Carter, and Rosalyn Carter. WASHINGTON — The nation’s most exclusive fraternity — the presidents club — assembled Wednesday to mourn George H.W. Bush, putting on public display its uneasy relationship with the current occupant of the Oval Office. The uncomfortable reunion brought President Trump together in the same pew with past White House residents who have given him decidedly critical reviews. Ahead of Wednesday’s state funeral for the late president, former presidents Barack Obama, Bill Clinton, and Jimmy Carter and their spouses chatted easily among themselves from their seats in the front row at Washington’s National Cathedral. The ex-presidents leaned over their wives to chat with one another. Bill Clinton and former first lady Michelle Obama shared a quiet conversation. ‘‘It’s unusual that a cabal of ex-presidents from both parties dislike a sitting president and that’s what you’ve got happening right now,’’ said Douglas Brinkley, a history professor at Rice University. By virtue of health, longevity, and opportunities for continued influence, ex-presidents are sticking around longer than ever and staying active in the public eye.